Running time approx. 105 minutes. 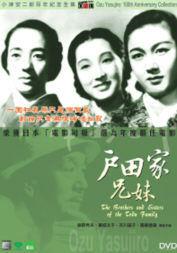 The first box-office hit for Ozu in Japan, The Brothers and Sisters of the Toda Family anticipates the later masterpieces such as Tokyo Story and The End of Summer. After the death of the father of an upper-class family, his wife and daughter has to struggle to survive. Tensions arise when they moved in with a married son, so they continue to move around from one household to the next, but they are always unwelcomed. When her youngest son returns from work in Tianjin, he scolds his siblings for their selfishness.